Today I was immersed into what I could only describe as complete and utter organized chaos!!! To start my day, I had breakfast for the last time at my B&B with six other Canadians who arrived early in the morning. They came to India for 2 weeks as part of their Masters program at McMaster University in Ontario. One girl actually did a Habitat for Humanity build in Bali last year, so it was nice to get hear about her experiences. My driver arrived at 8am to take me to Agra where I plan to visit the Taj Mahal. I am so glad I chose to stay at the Tree of Life B&B, as Ashwani was a gracious host, very helpful and came through on everything he said he would. My driver Kuldeep has actually worked for the Metropole Tourist Service for 13 years and told me his boss, Ashwani, was a great man and really enjoyed working for him. Ashwani actually took over the car company when his father passed away 20 years ago, so I figured I was in good hands for this part of my journey. We left Saket and headed through Delhi's insane traffic. Although there appears to be lines on the road, no one really uses them! People are all crammed into one another honking their horns, cattle are walking around everywhere (cows are sacred in India), tuk tuk's are filled with 10-12 people in them, there are motorcycles, buses, cyclists, rickshaws, tractors, you name it, it was there! On top of all that you had people crossing the streets all over the place...what a sight!! It took a good hour to get through the traffic and onto the main road to Agra. 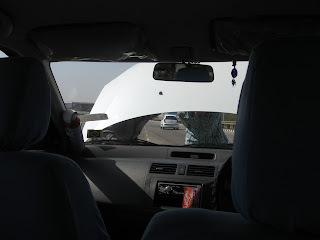 Now don't think the traffic stopped there, it went on and off for the entire 200km / 5 hour drive to Agra!! In some sections there were traffic police directing the traffic...not a job I'd want...not only because of the danger, but because of the crazy amount of pollution in the air. Car fumes were everywhere and many people wore scarves or masks over their faces to shield them from the pollution. Thank God I can't smell!!! Along the way we saw a couple accidents...I can't believe there's not accidents everywhere. It really is an art form to be able to drive in India. As I looked out my window on this drive I saw an incredible amount of garbage along the sides of the road, lots of rundown shops, pockets of shanties...some were made of mud...lots of brick building going on, people begging or peddling their goods along the sides of the road...all within this dense haze created by the heat and smog. What was incredible to me were the people. Most people were well kept and dressed nice, both young and old, all appearing to be going about their daily activities, dancing through the immense traffic, oblivious to the hecticness that was all around....a bit surreal I must say. It was really hard for me to comprehend how so many people live in this country (1 billion) within these conditions. I kept thinking where would one even begin to try and make things better...what a daunting task. I guess in some way I am doing my extremely small part by being part of the Habitat build in Pondicherry...it just seems so little. We traveled through four states on our way to Agra. Each time a registered tourist taxi passes through a state they must pay a fee. There were also many highway tolls along the way. When paying for the second toll our car stalled!!! As you can imagine, cars were honking their horns...what I surprise I know...when finally a few guys at the booth helped push us to the side. Kuldeep got what looked like a tire iron from the trunk and started tapping on something in the engine. I wasn't sure how this was going to fix things, but I really didn't have any other suggestions so I just watched and figured we'd eventually get going again...I hoped anyway!!! Sure enough when he go back in the the car it was up and running and we were once again on our way. Just a little blip in our plans and something to add to the adventure I guess. The third time we passed through a state Kuldeep had to get out of the car and pay the fare. What I saw as we drove up were all these white tourist taxis parked in a lane...a great target for all the people selling their goods...postcards, wooden boxes, jewelry, ect. The best thing to do is just ignore them, otherwise you will be swarmed by them all. One thing I wasn't expecting was for a monkey and her baby to jump up against my window....almost scared the crap out of me to say the least!!! The guy wanted me to take pictures of the animals so then he could ask me for money...crazy and sad all at the same time. After what seemed like forever...maybe 10 minutes...Kuldeep returned and we were off again. This time we stopped for a bathroom break. Yet another opportunity for people to try and sell things. Everything from wanting money for the tissue I was given when washing my hands, to selling food and clothing, to wanting money for music that was being played. One time I smiled at this little girl in a sari and not 2 minutes later she reappeared with her father who was playing an instrument while singing and she was dancing in front of me. They kept asking for me to take a picture...hard to look away knowing their situation, but not wanting to give anything knowing it would never end...heart breaking really. The day was getting hotter, I was getting extremely tired...not a great drive when you get motion sickness...and to tell you the truth I was getting tired of having people stare at me as they drove by, so I decided to have a little snooze along the way. When I awoke we were just arriving in Agra at about 12:30pm. To say the least this half of the day was overstimulating and the real sense of poverty...which is hard to even comprehend...was just starting to sink in....overwhelming really. But this was only the beginning of my journey to Agra, as the real reason I came here, along with millions of others from around the world, was to see the Taj Mahal. So for now, I'll let you digest my journey to Agra and fill you in on the rest of my day later on.